Secure Avondale High Security Steel Bike Shed. 81" x 41"Secure Avondale High Security Steel Bike Shed. 81" x 41"
Protect your bike or bicycles from thieves with the superb SafeStore ‘Security Avondale Bike Store’. With its own roof and front doors, it is very easy to store your valuable bikes. With bike theft on the increase the SafeStore Avondale Bike Store, give you the confidence that your bike will be safe for when you want to use it. Complete with 2 disc padlocks securely protecting from even the most determined thief. Constructed from extra thick 0.9mm thick Galvatite steel the thieves have no chance. Complete with sturdy steel floor for security and to stop vermin getting in. These superb, exceptional secure bike stores are available from this web site for delivery direct to your home anywhere in mainland Britain. The Avondale all metal bike storage shed is a generously proportioned bike storage solution for up to 4* road or mountain bikes. So much more than just a bike storage shed, the Avondale Cycle shed provides peace of mind for all your bike security and storage needs. Built from thick, heavy gauge, galvanized (weather proof) steel panels with a strong integral metal floor, a large easy lift (gas lift) lid and reinforced double door front access, this bike store is an ideal secure home for your valuable road and mountain bikes. 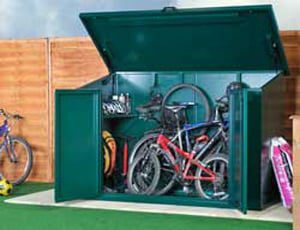 Fitted with two external shrouded locking points and an integral locking bar, this stylish and compact bike shed is an exceptionally secure and versatile storage unit. Supplied with two free key like discus padlocks (which will deter even the most determined thief), a 10 Year Warranty. You can see examples of the SafeStore range of security sheds at their metal shed display site is between Woking and Guildford in Surrey. You may not see this model but you will be able to see for your self how well built these SafeStore steel buildings are. All are complete with metal base, which can be screwed to your base, for extra security. Many bike stores available elsewhere mostly don’t have this great feature but are screwed straight onto the concrete which can allow water to enter the shed. There are many other companies which don’t give you an opportunity to view any of their products so, to a certain degree, you are buying blind. Just ensure you do your homework as the cheapest bike shed is not always (rarely) the best value. Don’t jeopardise the security of your precious bike to save a few pounds. Cladding: Hot Dipped-galvanised Galvatite steel – incredible thickness of 0.9mm (three times thicker than cheap metal sheds). Polyester paint finish. Choice of Colours. Guarantee: A 10-year anti-perforation warranty caused by rust is offered with all ‘Secure Bike Storage Metal Sheds UK’.